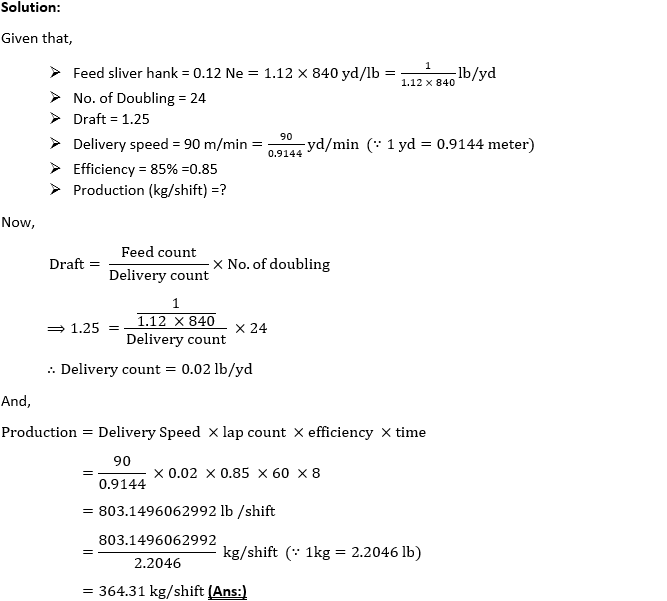 Problem 1: 70 gr/yd drawing sliver is fed in lap former to form a suitable package for comber, with draft and doubling of 2.5 and 24 respectively. 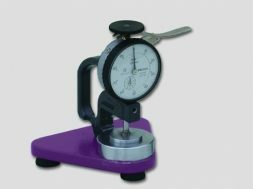 Calculate the weight of lab? 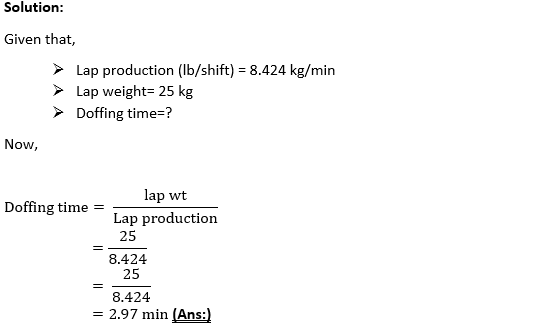 Problem 2: If production of lap former is 8.424 kg per minute with 25 kg lap, Calculate doffing time of lap former machine. 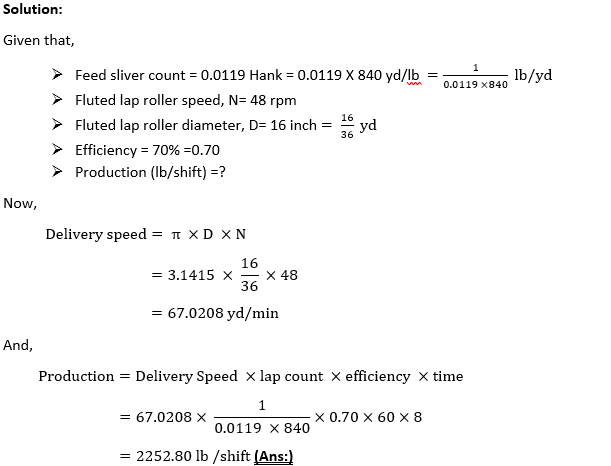 Problem 3: Calculate production of a lap former having following parameters: Feed sliver hank= 0.12 Ne, no of doubling = 24 Draft = 1.25, delivery speed = 90 m/min and Efficiency = 85%. 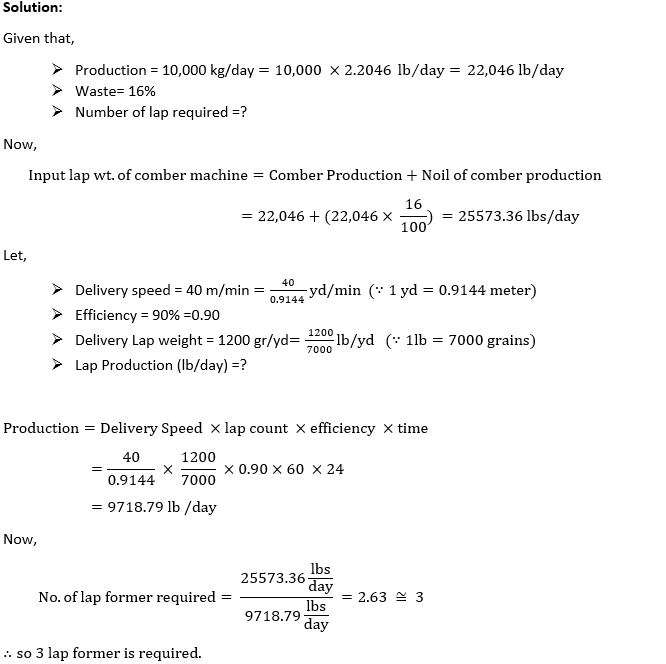 Problem 4: Find out the production of lap former machine in kg/day=? 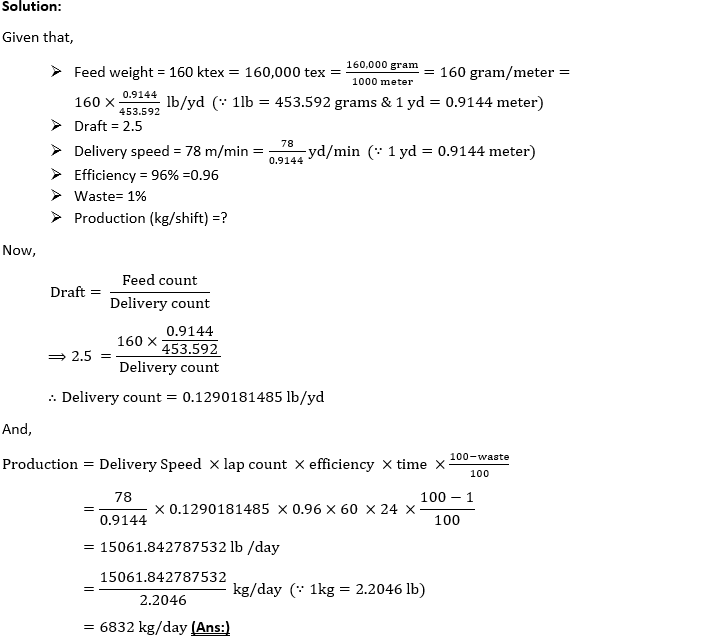 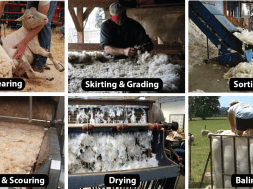 When delivery speed 78/min, feed weight = 160 ktex, draft = 2.5, efficiency = 93% and waste 1%. 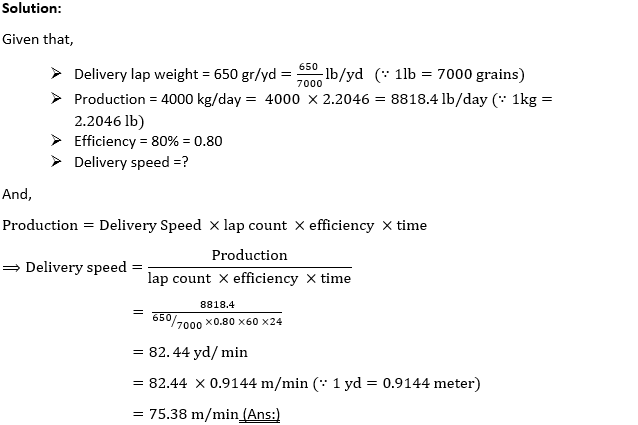 Problem 5: Calculate the delivery speed of lap former if production of lap former is 9500 lb per day with 650 gr/yd lap and efficiency is 80? 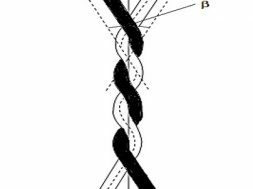 Problem 6: Find the no. 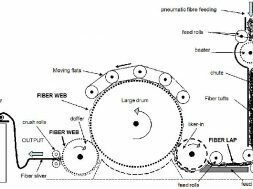 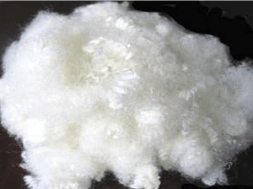 of lap former required to keep running 10,000 kg per day of combed sliver, which extracting 16% of comber noil. 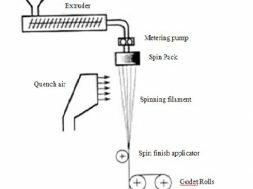 (Assume all necessary parameters). 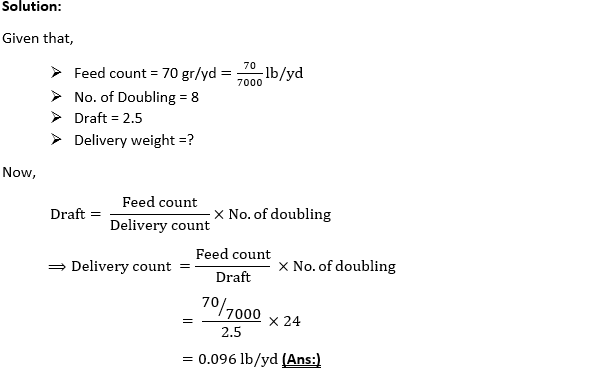 Problem 7: The speed and dia. 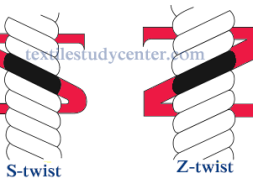 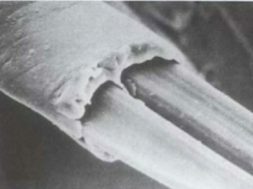 of the fluted lap drum of a sliver lap m/c are 30 rpm and 16” respectively. 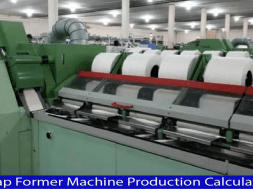 If 24 card cans having 0.15 Hk sliver are fed to the m/c what will be the production in one shift at 70% efficiency? 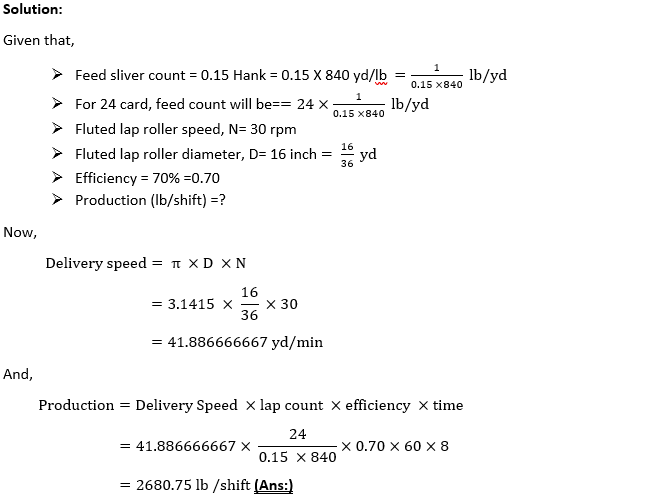 Problem 8: Calculate the production of a ribbon lap m/c in 8 hours at 70% efficiency if the speed of 16” dia. 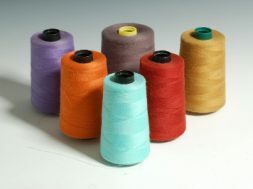 lap drum is 48 rpm and hank of ribbon lap is 0.0119.